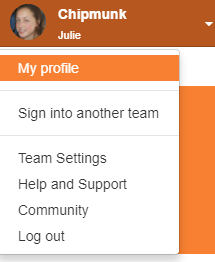 Click on the arrow next to your username in the upper left corner and select My Profile. Here, you can update your Name and Display Name. You’ll also see your current profile image, which can be updated at gravatar.com. To update your email address, Contact Us using the link below. Make sure to contact us from the email address we have on file currently. Need to delete your Chipmunk account? See more info here.